Q. Over the past 10 days we appear to be witnessing chaos theory at work in Gaza and Israel. A $15 million Qatari cash gift to Hamas, followed by a botched IDF commando operation, led to the resignation of Israel's defense minister which in turn threatened to precipitate new elections. Did we miss anything? A. Yes, the dark hints from PM Netanyahu and the IDF that the real security preoccupation is to Israel's north and that that unspecified threat requires Israeli restraint in Gaza. Further, Netanyahu, in appointing himself defense minister on Sunday, appears to have successfully argued that the threat requires avoiding a divisive election campaign now. Q. Let's break this down step by step. First, why send an Israeli commando unit deep into the Gaza Strip at such a sensitive time, when the Qatari cash was supposed to be priming a new attempt by Egypt and the United Nations' skillful envoy Nikolay Mladenov to foster a ceasefire and confidence-building process between Israel and Hamas? A. Israeli security forces periodically carry out clandestine penetrations of enemy territory--in Gaza, southern Lebanon and Syria, all fronts where militant Islamists continue to reject Israel's very existence. These operations reflect a variety of objectives deemed vital to Israel's security. The IDF mission that went violently wrong Sunday night a week ago was described by Hamas as directed at installing devices for monitoring Hamas communications and possibly Hamas attack tunnels. It is extremely rare for such a mission to go wrong, be discovered by the enemy, and end up in Israeli casualties. Worse, the timing was to say the least problematic--at a time when efforts were being invested internationally, by Egypt and the UN, to position Israel and Hamas back on the road to some sort of stable ceasefire. Q. Next, why did the flare-up of violence generated by Hamas's response to the botched operation and the Hamas casualties it caused last less than two days? A. Both Israel and Hamas remained interested in that ceasefire, each for its own reasons. Hamas is weak and politically isolated. While for domestic ideological purposes it needs to be seen as fighting Israel, it does not want the fighting to lead to an invasion of the Strip or to overwhelming damage. Once Israel's response to hundreds of Hamas rockets included bombing and toppling Gaza's high-rise buildings--within a day of the start of fighting--Hamas knew it could anticipate mass criticism from the Gazan population and accordingly sought a renewed ceasefire. After taking credit for both initiating massive rocket fire at Israel's Gaza periphery and then initiating a ceasefire, Hamas was able to save face and claim some sort of "victory" by toppling Israel's defense minister, a politician of blustery threats and little to show for them. As for Israel, one strategic reason to avoid a major new campaign against Hamas was apparently preoccupation with the far more serious threats from the north, where Iran continues its military buildup while relations with Russia have become problematic. This consideration, only hinted at by Netanyahu but backed up by the entire security community, is perceived as dictating a minimalistic approach to violent provocations from Gaza lest Israel find itself in a two-front war, north and south. Still, the renewed ceasefire left many Israelis--not only far right-wing ministers Liberman and Bennet and not only those living near Gaza and exposed to endless rocket fire--with a sour taste of capitulation to a terrorist enemy. Then too, Netanyahu apparently still hopes that the on-again-off-again ceasefire with Hamas can be leveraged into a broader agreement. It would repatriate the remains of two IDF soldiers that Hamas has held since 2014 and lay the foundation for a genuine international effort to brake Gaza's descent into absolute humanitarian and economic chaos. Qatar will apparently cooperate for the next half year with fuel and money for the Strip; Israel will open the Gaza crossings when quiet prevails. Alternatively, a Gaza ceasefire would at least postpone the next war until a time of Israel's choosing. Can the Egyptians or Mladenov or anyone else turn this opportunity into a stable arrangement that enables infrastructure investment to flow into Gaza? A lot depends on the Palestinians themselves. They are hopelessly fragmented, poorly led, and in Gaza led by a violent political ideology. But Netanyahu has a tactical-political reason as well for restraining Israel's response. New elections are constitutionally mandated within a year; they will probably happen earlier. The last thing Netanyahu wants in an election year is to be blamed for more Israeli casualties, both military and civilian, on the Gaza front--casualties incurred in a mini-war that, like its three predecessors in the course of the past decade, ends without materially changing the tragic status quo between Israel and Gaza. Further, with possible criminal indictments against him looming, Netanyahu apparently fears any new development that could trigger early elections. Q. Enter Defense Minister Avigdor Liberman . . .
A. Liberman, like Education Minister Naftali Bennet, has consistently advocated a more hawkish approach to Hamas and been blunted by Netanyahu and the security community. Last Tuesday's Gaza ceasefire was seized upon by Liberman as the occasion to resign and pull his Yisrael Beteinu party out of the coalition in protest at what he termed Israeli defeatism and loss of deterrence. Bennet immediately presented his own ultimatum: either he gets the defense portfolio or his Jewish Home party leaves the coalition. Both politicians rode a wave of popular anger at the Netanyahu government for "capitulating" and agreeing to a ceasefire rather than inflicting heavier damage on Hamas. Liberman's resignation left Netanyahu with a coalition of 61 (out of 120 members of Knesset). This narrow majority is extremely difficult to manage over time in view of the many disparate and rebellious elements still remaining in the coalition--some of them minor coalition partners like Shas and Kulanu and some within Netanyahu's own Likud party. Bennet's departure would leave Netanyahu with a mere 53-strong minority coalition. But capitulating to Bennet and appointing him defense minister would confront Netanyahu with a hawkish religious-ideological partner whose aggressive initiatives he could not control nearly as easily as he deflected Liberman's. Q. This set the scene for dramatic statements by Netanyahu Sunday night and by Bennet Monday morning. A. Sunday night, Netanyahu addressed the public and announced that he himself was assuming the defense portfolio. After laying out his personal qualifications for the job and explaining that Israel faces security threats that he cannot present in detail to the public but that he is qualified to deal with, Netanyahu in effect challenged Bennet or any other coalition partner for that matter to pull out over issues of personal political ambition at a time of virtual but unspecified security crisis. Ominously, he warned that the real challenges Israelis face would ultimately require them to "sacrifice". Bennet had originally scheduled a Monday morning statement to announce his departure from the coalition--meaning new elections. Now, in view of Netanyahu's maneuver Sunday evening, Bennet instead responded by backing down. First he criticized Netanyahu's over-cautious handling of security challenges for the past decade ("he turns politics into security", "Israel has stopped winning", "IDF fighters are more frightened of the chief military prosecutor than of [Hamas leader] Sinwar"). Then he recited his own credentials for the defense ministry job, by the by displaying his own dangerous misunderstanding of the current Islamist, mainly non-state and low-intensity threats Israel faces. 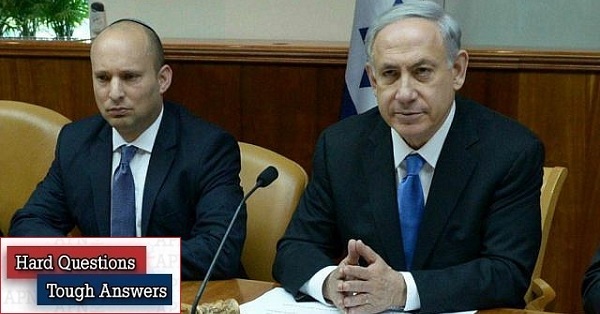 But then, in a dramatic about-face, Bennet stated that he is prepared to take Netanyahu at his word, stay in a coalition in which Netanyahu is personally responsible for security, and see whether Netanyahu is up to the job. Both Netanyahu and Bennet made what sounded like campaign speeches. But Netanyahu won this round, Bennet was obliged to back off, elections were postponed, and for the moment nothing changed on Israel's multiple security fronts. Q. Yet things will undoubtedly change in the weeks and months ahead . . .
A. Indeed they will. There could be a real war with Hamas or, more likely, with Iran and Hezbollah on Israel's northern fronts, with Putin's Russia posing the danger of complications with a neighboring superpower. 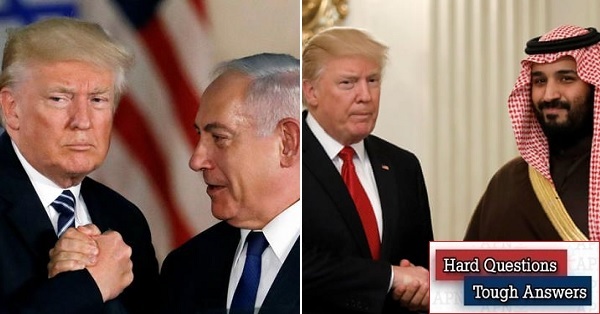 Then too, eventually President Trump may actually present a peace proposal for Israel and the Palestinians, requiring his loyal ally Netanyahu to respond and risk alienating some of his supporters. Now that elections are for the moment postponed, Trump may not wait much longer. Finally, one of these days Netanyahu could be indicted on corruption charges. For his part, Netanyahu cannot for long hold onto all three major strategic portfolios: prime minister, foreign minister and defense minister. He will presumably soon divest himself of the foreign ministry, which is the lesser prize. But to whom will he award it? And how will this affect coalition stability? All these developments, real and imagined, will continue to be factored into Netanyahu's electoral calculations. Elections must take place within a year. It is hard to envisage the Israeli polity and a fractious coalition of 61 waiting until then. Still, Netanyahu has just masterfully engineered yet another triumph over his right-religious partners. He has proven yet again his political genius. His many political rivals suspect, not without precedent, that he is hiding behind a trumped-up security threat for political reasons, yet they dare not call his bluff and risk paying the price. Finally, almost entirely absent throughout this drama has been the real Palestinian issue: under Netanyahu, Israel and the Palestinians continue down a slippery slope toward an ugly and violent one-state, binational reality. Somewhere not too far down the line, Israel's right-nationalist-messianic mainstream will come face-to-face with the disastrous outcome it prefers for now to either cultivate or ignore. Chaos theory remains alive and well in the Israeli-Palestinian equation.